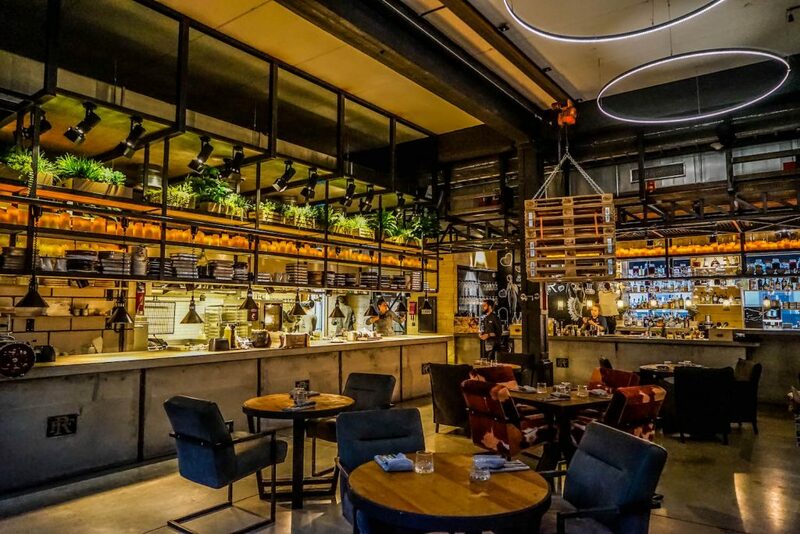 Tallinn might be an obvious travel choice for medieval fairy-tale charm, hidden hipster hotspots, and evocative hotels, but one of the unquestionable highlights of Tallinn is its contemporary new Nordic dining scene. 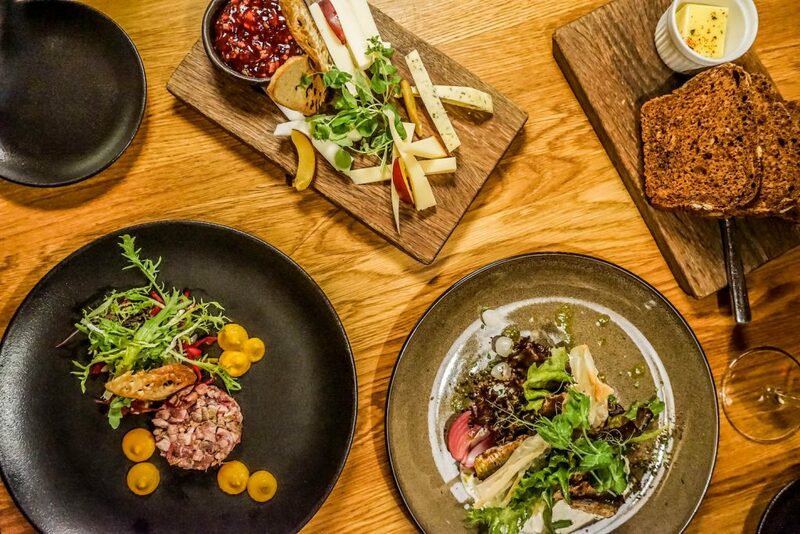 The result of a rich historical tapestry of cultures and influences, here are our picks for the best restaurants in Tallinn to try on a weekend visit! Lying in the east of the Baltic sea, only 70 km south of Helsinki, Tallinn was founded almost a millennium ago and has centuries of history trading – and being traded by – Russia, Denmark, Sweden, and Germany. Each nation has left their unique mark on the sublime Estonian foodie scene that has burgeoned here in recent years. Lead by a diversity of talented Estonian chefs; this culinary revolution is being fulled by fusing Scandi-style cooking with fresh, local and seasonal ingredients. Learned from working in kitchens across northern Europe, and assimilated the Nordic style first hand, these chefs have returned home and used Estonia’s beloved forests and ingredients as a source of inspirations. New Nordic dining with an Estonian twist. Spruce shoots, wild mushrooms, grated green pine cones, orange sea buckthorn berries, and linden flower jelly can all be found creatively used in this cooking revolution. And don’t be surprised when spiced Baltic spratz, dark rye bread and plenty of fish and game make appearances. Traditional food preservation techniques have also been embraced again, so expect lots of pickling, salting, smoking, pickling, and drying. 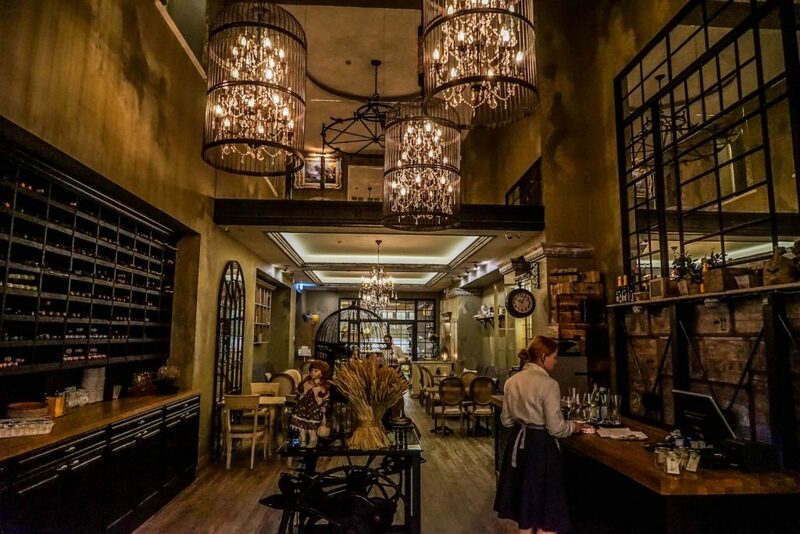 The result is an exceptional dining scene brimming with innovative dishes at affordable prices. Yes, unlike eating out in Copenhagen, Olso, Turku or Bergen, indulging here does not cost the same amount as a house in a third-world nation. The perfect dining experience and only by a stroke of rather serendipitous luck did we find ourselves here – with another restaurant close by being booked out. There is a lesson here: In Tallinn, book your favorite restaurants in advance, or you will miss out. 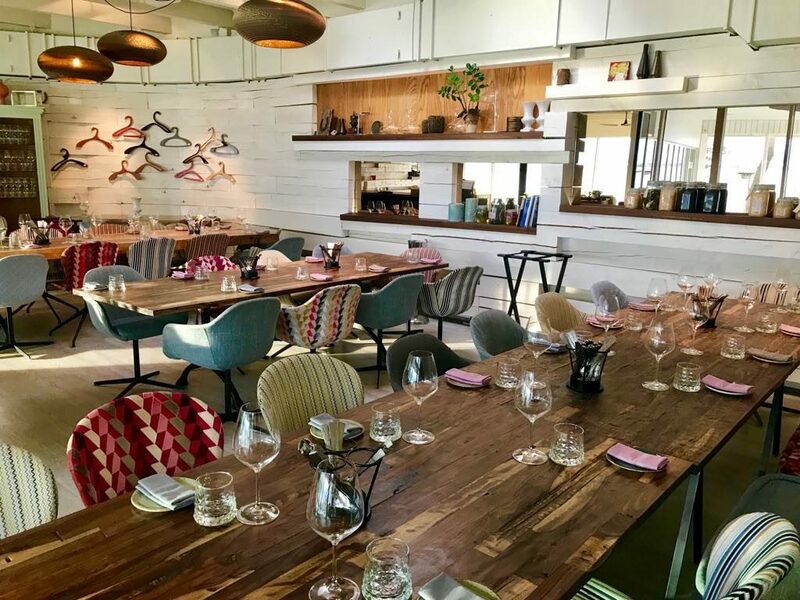 Still, as in-the-know locals and foodie visitors already knew, Rataskaevu 16 is a standout local gem, known for its friendly service, delicious food, and magical atmosphere. It feels like you are dining in an – very trendy – Estonian grandmother houses, in fact, it might well have been at one point. 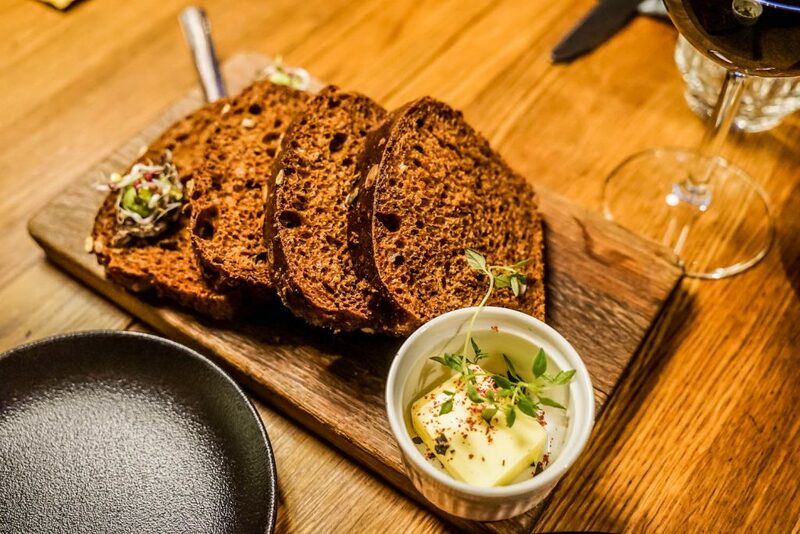 We are also told the delicious dark rye bread served complimentarily is actually from the chefs own grandmother, and baked on location – we can see why the recipe is still a closely guarded secret. It is easily the best in town. For starters why not try the divine fried Baltic herring fillets with pearl onions, fresh salad, roasted breadcrumbs, and cottage cheese sauce, or oven baked goat cheese served with warm vegetables and berry sauce. Moving on, the braised elk roast with cauliflower cream, parsnip, carrot and blackcurrant sauce was a heavenly experience, as was the pan-fried white fish with marinated kohlrabi, lentils, carrot chips, and a lemon-butter sauce. Save room for dessert with a bizarre blue cheesecake with carrot and sea buckthorn sauce and berries – trust us, it works. Our only complaint would be a lack of a cocktail menu, but this is grandma’s house after all so the very affordable wine did end up being more fitting. And, much like the entire philosophy here, it is do something well or don’t do it at all. No one likes paying through the nose for a sub-par cocktail anyway! 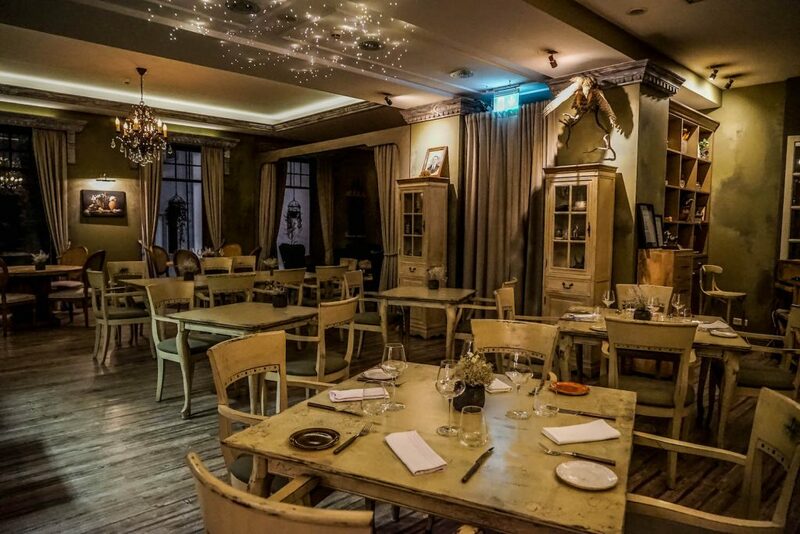 High-quality food with extremely reasonable prices, extremely knowledgeable staff, and a warm environment, Rataskaevu 16 is one of the must-try restaurants in Tallinn. 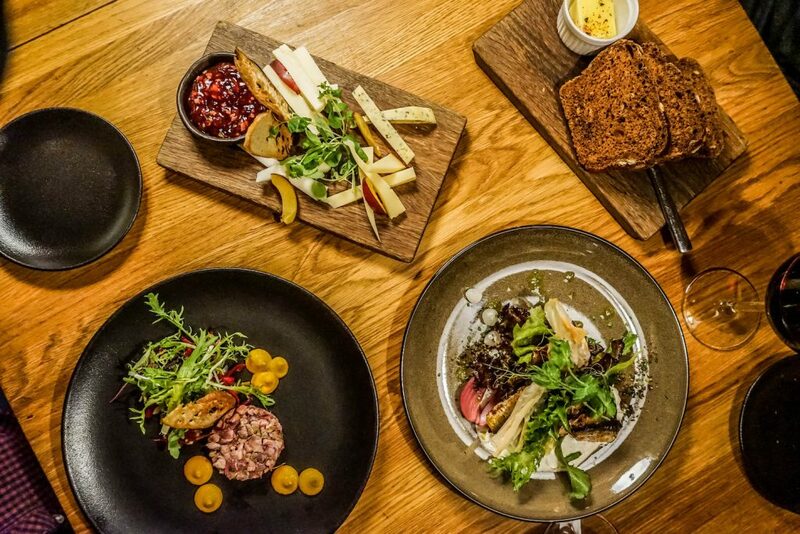 Ask any foodie who is even remotely acquainted with Tallinn and one of the first recommendations off their lips will surely be Farm. And after going and checking it out for ourselves, we can totally see what all the fuss was about. 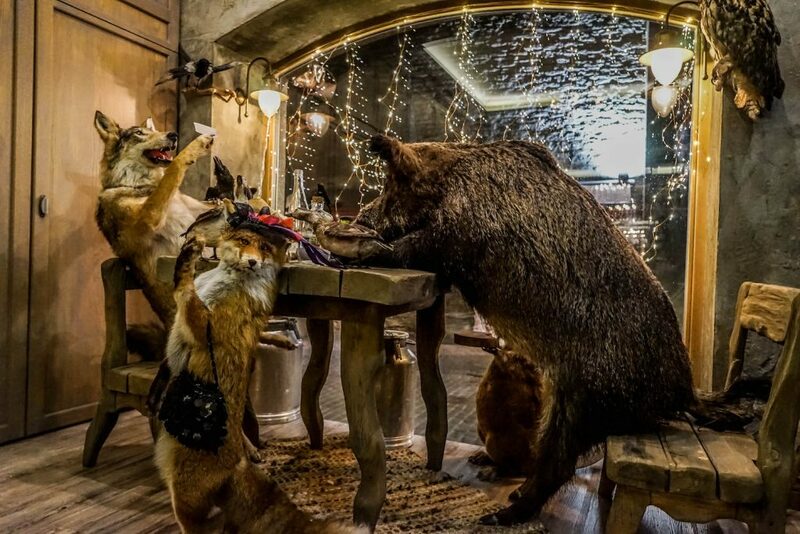 Greeted by rather bizarre taxidermied animals playing poker at the front door, inside Farm the talented team has created the atmosphere of an Estonian farm right out of the bourgeois period. 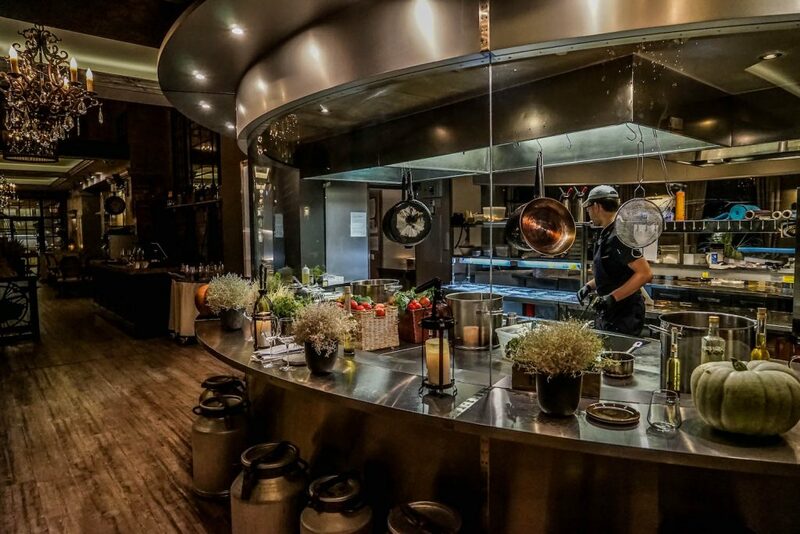 Located in the very heart of the medieval Tallinn, a highlight was the panoramic open kitchen where you could see the talented chefs making use of local ingredients on the open fire grill right before your eyes. 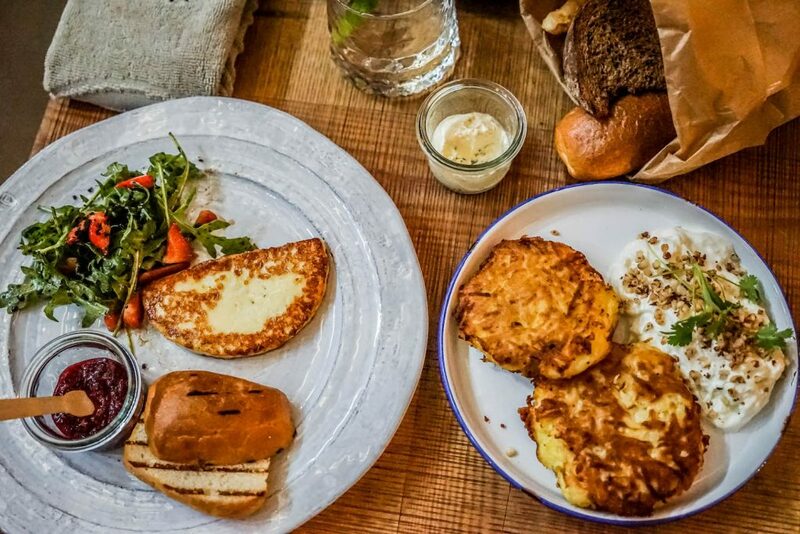 As you would expect, local ingredients, fresh game, natural products, herbs, and preserves all feature prominently on the menu – and there is even homemade beer to complete the rustic Estonian farmhouse feel. The menu was just as creative and comforting as you would expect – although prices were on the higher side here. Quality does not come cheap, as they say. To start, we have to recommend the eccentric stick ice cream made of spiced baltic sprats, soft egg, fresh cucumber and herb salad with creamy dill milk. Trust me; you will never have tasted anything like it in your life. Or for a safer option why not tempt yourself with the Järveotsa quail pate with cherry jelly, roasted nuts, quince sauce, and rosemary-thyme bread? For mains, again you are spoilt for choice, but there were two clear highlights: the grilled Saaremaa game fillet with mushroom risotto, Jerusalem artichoke cream, and red wine-blackberry sauce, and the fried pike perch with potato-broccoli cream, butter-braised green vegetables, and hollandaise sauce. For dessert, we actually loved that you could just choose individual portions of their wonderful home-made ice-cream, which was extremely affordable with generous portions. Flavors include rye malt, buttermilk, chamomile or there is a blackcurrant gelato. If you are still quite hungry, however, the Esko farm’s yogurt and linden flower jelly with home-made multigrain cookies and raspberry sauce looked angelic. Even better? 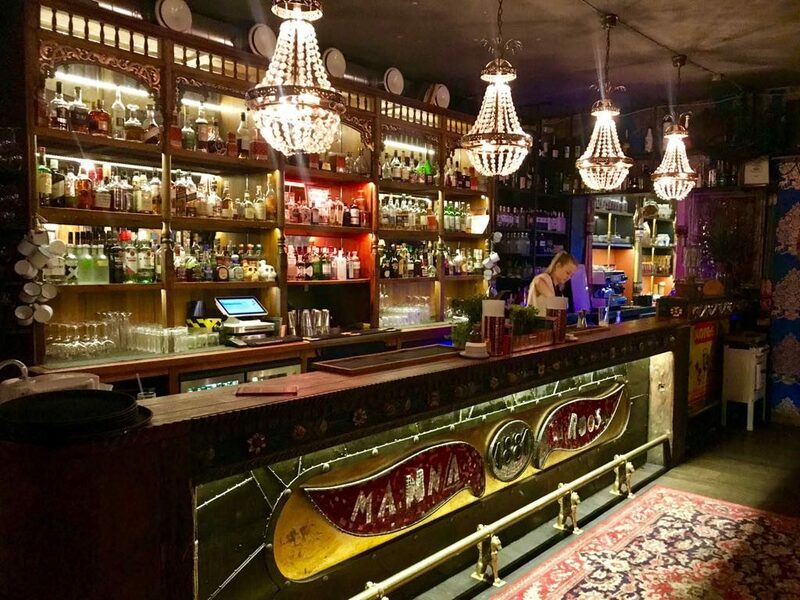 The food and drinks at Manna La Roosa are out-of-this-world, I mean, it has to be to complete with its loud and exuberant interior. The grilled octopus with tomato and asparagus was divine, as was the Ostrich Tartare with spicy alike and quail egg. 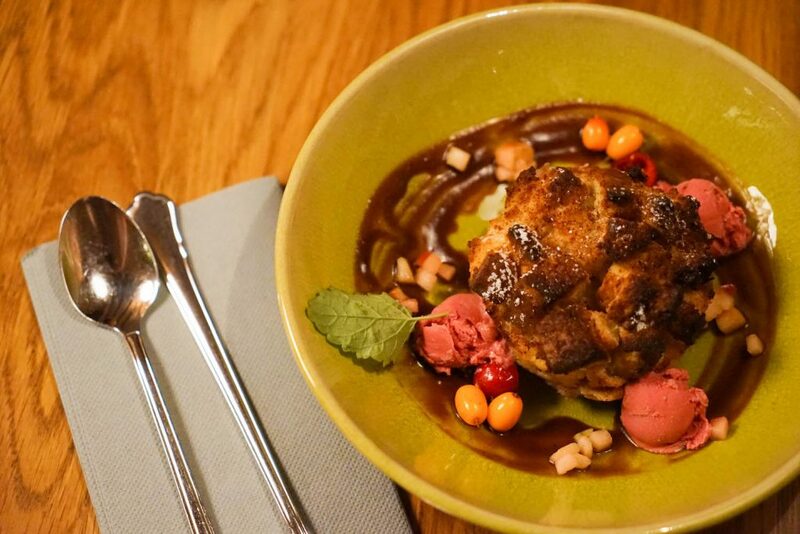 Manna La Roosa is also the perfect place to the try mannavaht, a traditional pink and fluffy dessert that reminded every Estonian of their childhood. 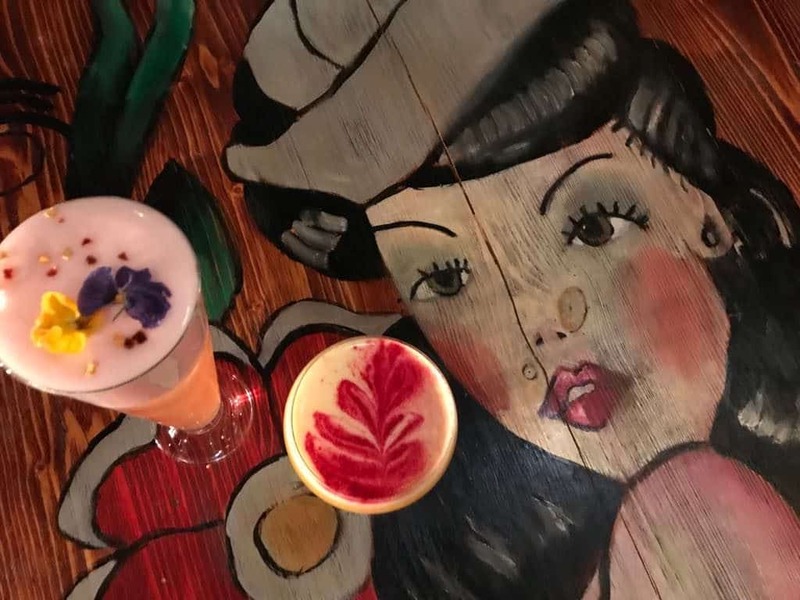 The drinks at Manna La Roosa were even more standout, so good in fact you can just pop in for a quick nip and to admire the psychedelic walls or gorgeous bar – even if you head on for dinner reservations elsewhere. 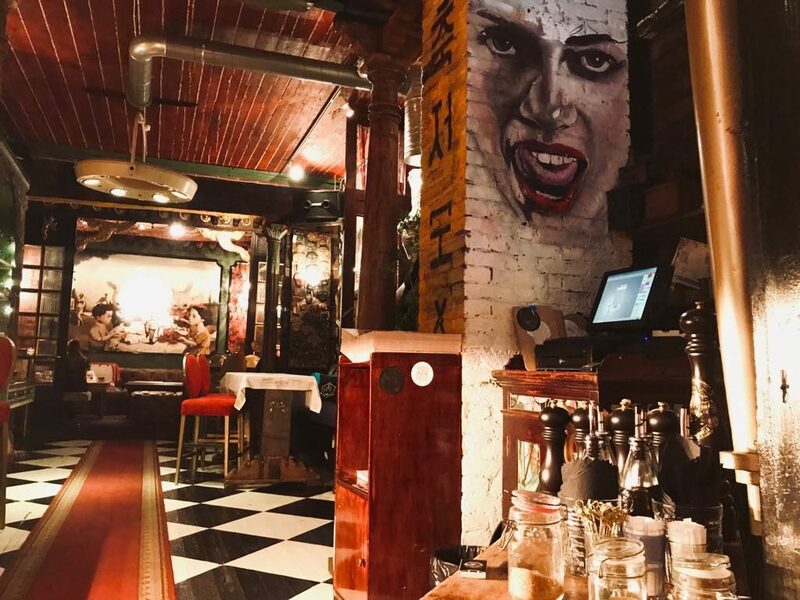 Housed in the same historic building, there is the equally beautiful Tai Boh upstairs with a similar LSD-inspired design palate but with an Oriental theme. Both are a must for foodies and design fans, but reservations are absolutely essential in summer months or weekends. It’s fair to say this self-created kitschy-freaky-crazy dining combo has been a massive hit! Thankfully in the heart of the medieval city, on the buzzing main street just steps from Viru Gate, you will find the pleasantly old-fashioned and quiet little cafe called Rukis. 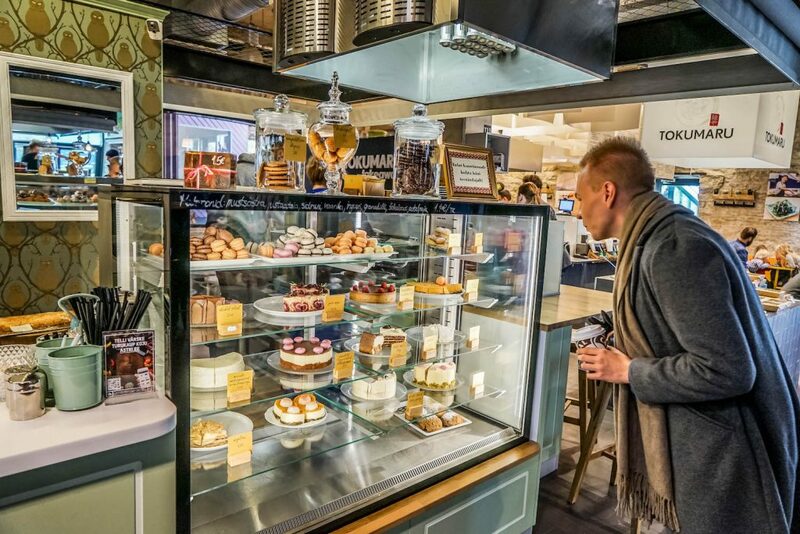 All you need to do is step inside, and you are immediately washed over by the welcome aromas of confectionary, fresh-baked goods, and the busy kitchen. A heartwarming feeling of nostalgia and the perfect place for a relaxed breather to clear your mind before starting on a busy day ticking off all the best things to do in Tallinn. 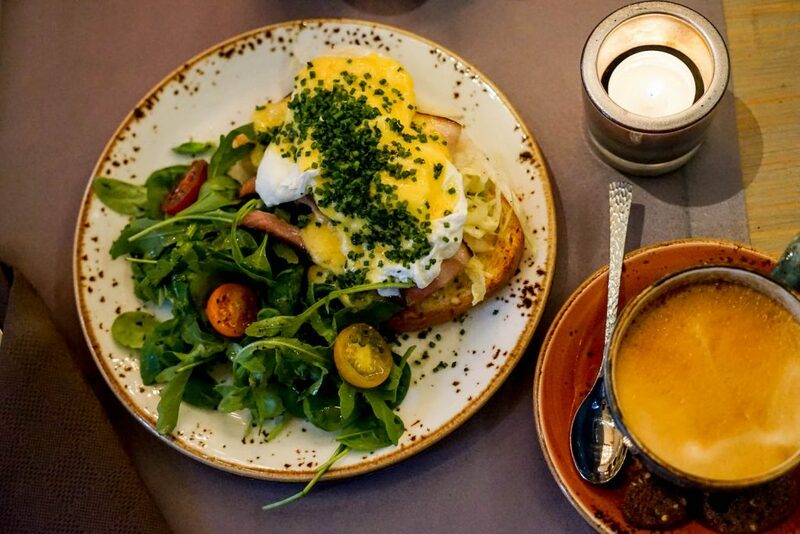 In a town that has yet to truly embrace the concept of brunch, Rukis is a welcome trend setter with a mouth-watering selection of breakfast – best enjoyed with a freshly-brewed coffee or hot tea. 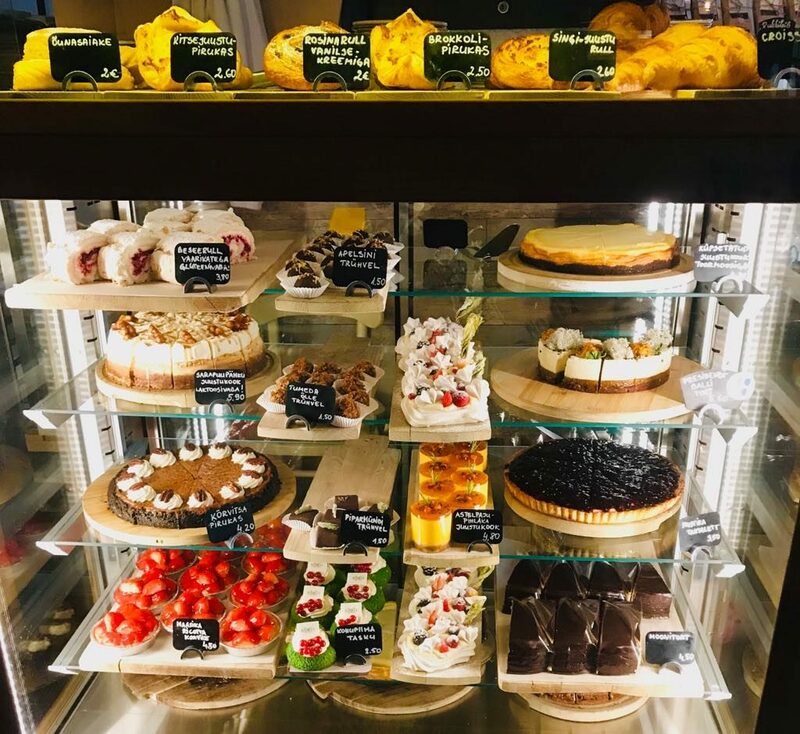 It would be easy for the team here to just rest on their laurels, after all – almost no one else in town is open this early, but luckily their menu is as animated as their decor – and had the lowest prices of any restaurants we visited in Tallinn. Pop in to try their buckwheat porridge with home-smoked ham and mushrooms or the rustic homemade rye bread with hemp seeds, spiced sprat, soft egg, farmhouse butter, and herbs. Each tempts you with a very hearty start to the day! For a lighter meal, there are delicious thin pancakes with fresh berries and curd cheese or grilled goat cheese and toasted brioche. You should also ask about their rustic home-made jams available as sides for all meals and include delightful flavors like strawberry, blueberry, raspberry, rhubarb, and cherry. Rukis is open until 8 pm every night, so even if you have breakfast already included at your hotel, you can visit for an afternoon snack when they are less busy. We recommend the juicy rabbit meat burger with iceberg lettuce, onion marmalade, Emmental cheese, and mustardy mayo sauce. Or just indulge in a relaxed coffee and sweet pastry from their picturesque window seat where you can sit and watch the world go by. 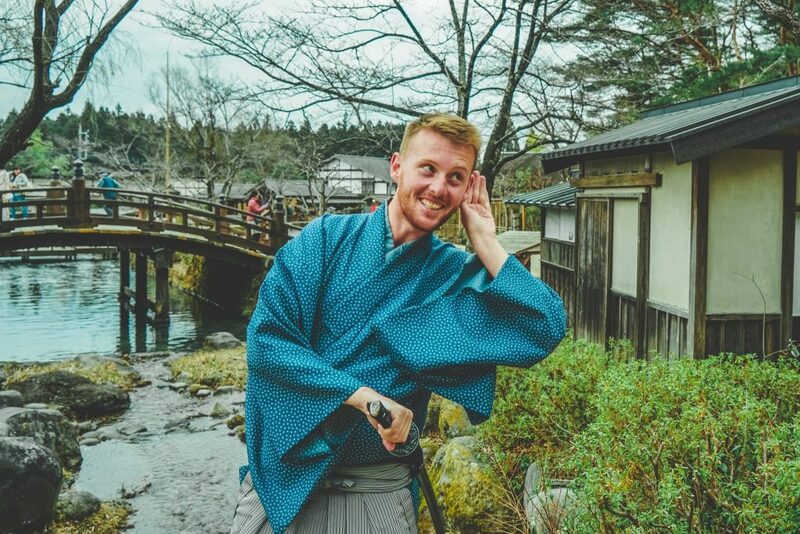 The staff are fabulous and won’t judge! For an over-the-top fine dining extravaganza, you will need to head out of town to NOA, one of the world’s 50 best restaurants. Only 15 minutes by taxi, NOA is famed for its seaside location, grand architecture, and chic interior design. 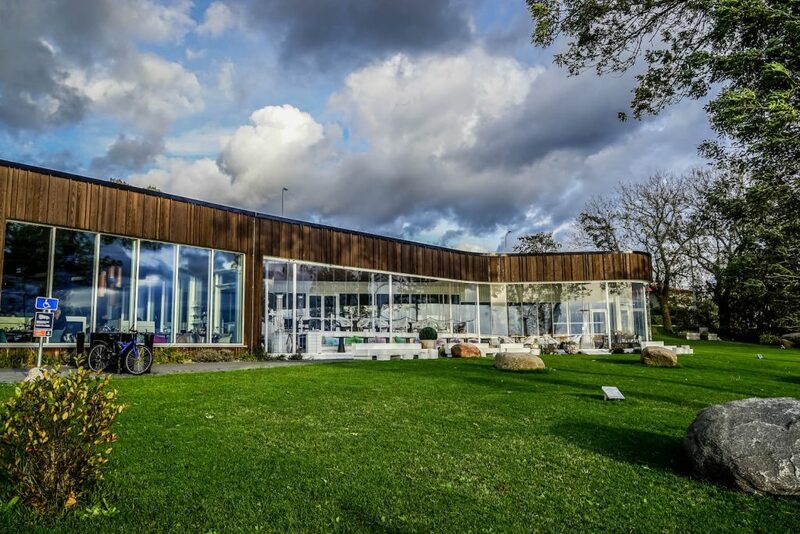 Not to mention the original flavors and panoramic views of the Tallinn skyline and the sea. A dinner at NOA does not come cheap, and you often need to reserve weeks in advance – especially during the busy summer season – but for your efforts, you will be rewarded with bold global flavors, delicious cocktails, an eccentric wine list and sea-views from every, single table. This wood and glass architectural gem wouldn’t look out of place on a Grand Designs episode, but once you have sufficiently appreciated the design and views you can move on to the menu. Why not start with eggplant caviar & cheese profiteroles or their signature green “taco” with caesar sauce, walnuts, celery, apple, and crispy panko? Then for mains be tempted by juicy scallops with apple-zucchini salad, shisho leaves, and a lemongrass sauce or the warming red lentil curry with papadums, coriander, curry leaves and coconut milk. 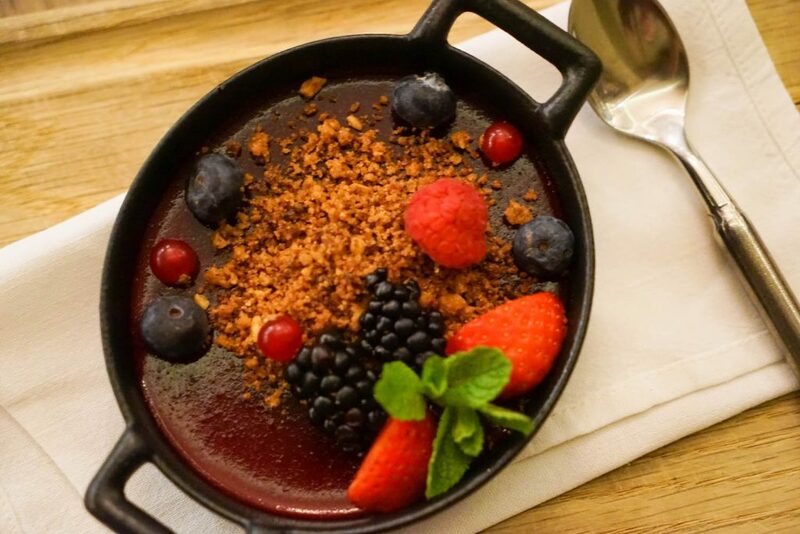 NOA changes their menu seasonally, to reflect the availability of local and international ingredients, so no matter when you visit you are sure to find a delightful surprise. One thing we hope that stays? The ‘#SEXWITHEX” dessert of goat cheese, crème brûlée, beeswax ice cream, and raspberries. It tastes are incredible as it sounds, but without the regret and emotional baggage afterwards. Overall, the architecture, views, food, drinks, and staff were all perfect – as you would expect at a restaurant of this caliber. 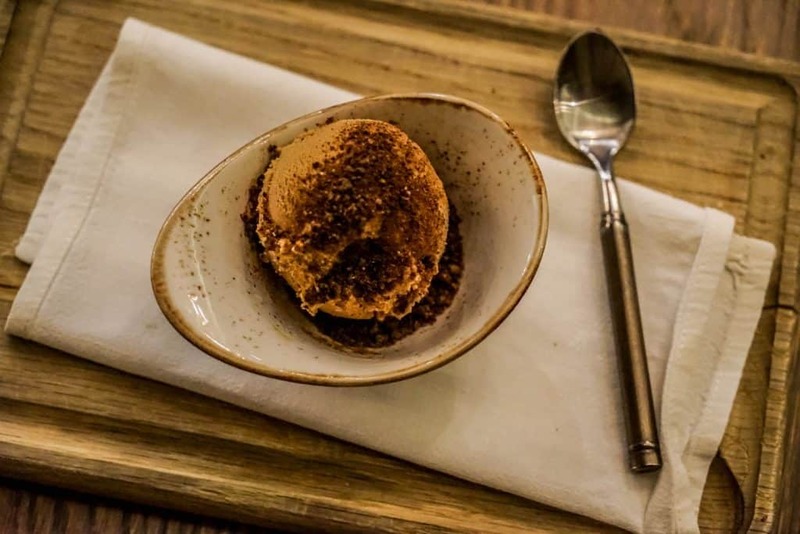 We do wish NOA was a little more locally focussed regarding their menu, but still – dining here promises to be an experience you will never forget. 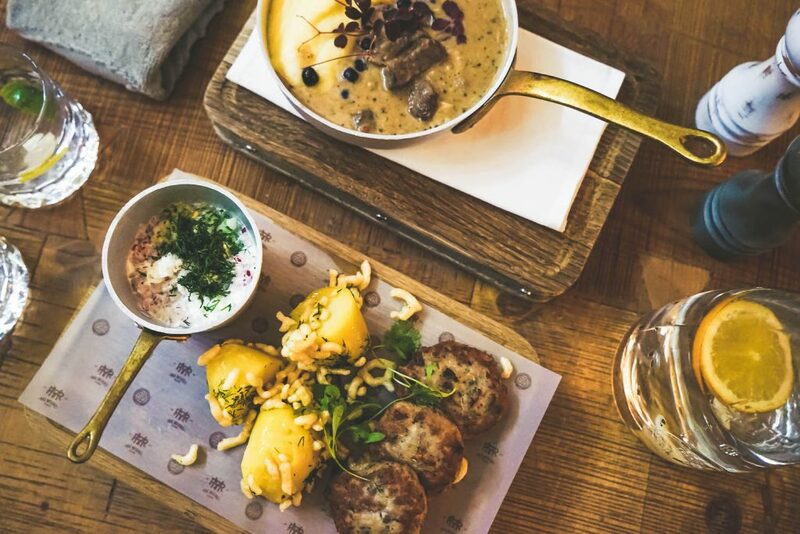 If we were forced to choose just one place to recommend it would have to be the newly opened Rae Meierei, from the creators of the already famous Farm and Rukis – all of which are in the Tallinn Old Town. 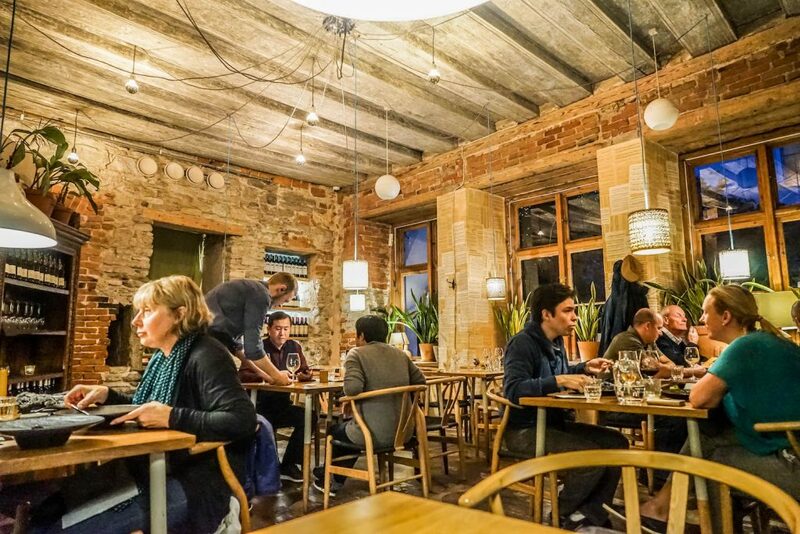 To start with, the interior of Rae Meierei is unique and utterly mesmerizing with industrial details, funky art, liberal – and slightly ironic – use of wooden palettes and an open kitchen where the real magic takes place. It is here that the talented chefs create authentic and distinguishing dishes embracing Estonian and international cuisine using most ingredients from small producers in Estonia. Fresh, rustic and oh-so-delicious, I loved the Duck fillet, lightly smoked with apple chips, honey pear, and cherry sauce and the catfish with dill and sour cream horseradish sauce was divine. The Potato pancakes with stracciatella cheese where also how I imagine a hug from my Estonian grandma would feel, if I had one. You should also try the adult Blackcurrant smoothie crafted cocktail with blackcurrant cognac, blackcurrant puree, orange juice, maple syrup, peppermint, and egg white. Again, book ahead at peak times to avoid disappoint. Rae Meierei is justifiably popular.